Yesterday was a hiking day and I decided today was a Disc Golf Day. 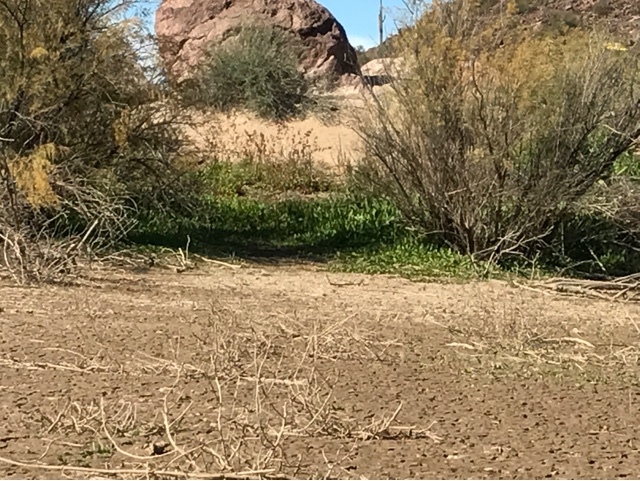 After I downloaded my podcasts this morning I went to one of the Tucson park courses and when I got there mid morning there wasn't any parking available. 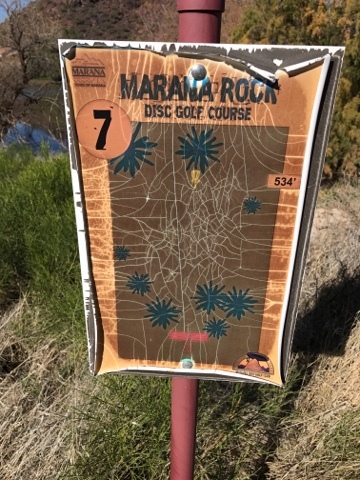 I just drove to Marana Disc Golf and I was so disappointed that the course hasn't been maintained. The reason it isn't maintained and has been going downhill for the past 4 years is in part to the fact it was built around and through a drainage basin. Above the ground at hole 7 crosses the basin where it has dried. 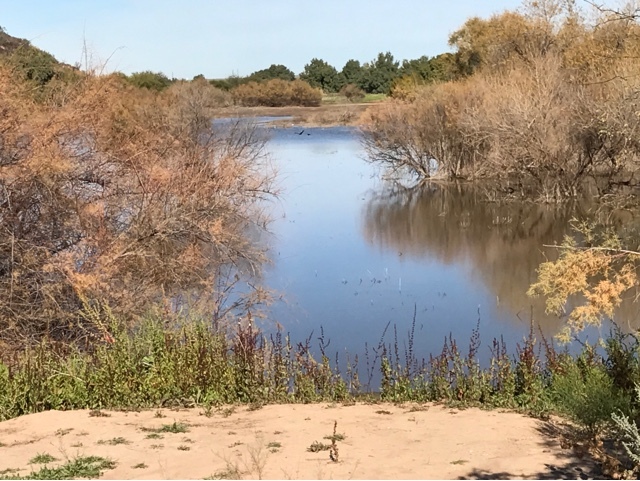 The basin is there as a retention for surface water runoff to store the water and slowly release it as well as retain the sediment from the runoff. This results in the areas at lower level are under water or drying from being under water from rain as is the case in hole 7. Other parts where the holes used to be are under water. The back holes that went through the basin have been moved to the retention ring around the basin leaving a bet uninteresting course and they don't have pads or markings for the moved baskets. This used to be a wonderful course with interesting drives and basket placements. Nothing lasts for ever I guess. For my needs today to get some practice in after months of not playing, it worked. As I'm going to Quartzsite tomorrow and there are no theaters close I chose to catch a movie. 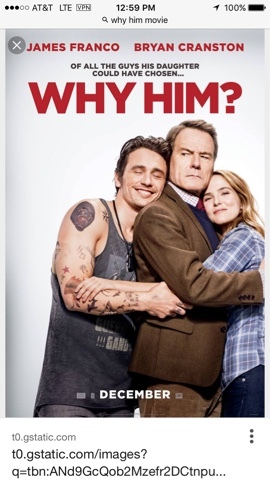 I'm partial to comedy and relationship twists I chose Why Him? It was a good movie with age related circumstances and a couple of twists to keep you interested. If you like mindless it is more advanced than that with a well thought plot. Acting was decent and believable to the extent of the storyline. I thought I would share my weather here considering that it was in the teens at home in Massachusetts today. Yes, I enjoyed it. After the movie it was time for laundry at the laundromat I frequent when I'm here. There was a guy there I remember from prior years although we had never met. We have now met and Bruce is a fire buff as he listens to the scanner. We chatted for some time while our was was getting done. The sun was just near setting when I made it to Walmart to stock up on groceries for my stay in Quartzsite at the RTR. The thing I do at Walmart is to depackage what I buy so I can fit lot in my compressor fridge. Examples include the tub of salad greens. I stuff the in a gallon ziplock bag and toss the plastic tub away. Chicken breast I remove from the foam plastic wrapped container and put in a quart ziploc bag. Doing not only helps with space in the fridge it also gets rid of bulky trash there, and I don't have to store and carry it around with me looking for a spot later. I park at Walmart next to a trash container usually collocated with the carriage coral. I don't primarily because I don't play leagues to meet others. I'm kind of this solo wandering guy who plays here or there often by himself. I do at times go to play and there is another single player and we link up and that works. Last fall at my last outing before the cold set in I was playing the Fitchburg course and the guy in front of me lost his disc on the third hole and I stopped to help and found it. We played to the 9th hole as he was on his lunch and needed to get back to work. I heard the weather was snow then freezing rain at home yesterday. We had some light showers overnight.